(Tech Xplore)—Many drivers could use a reminder that ignoring or neglecting tire care is not an option. Mike Hanlon, New Atlas: "It's remarkable but true that most of the cars in any given carpark have incorrectly inflated or damaged tires." Yet "those black round things," as he called them, are key to moving around and supporting car safety. Hanlon also said, "if tires are incorrectly inflated, the handling and safety of the car they are fitted to will be diminished by somewhere between 20 and 99 percent of their optimum." Small wonder that sensors embedded in tires and rims have grabbed attention this month with Continental announcing new tire concepts. Matt Kimberley in CarThrottle said Continental's two tire technologies included electrically-conductive rubber – and wheels that can change shape and alter tire pressure to suit road conditions. The two ideas have done their own rolling-in as a single concept tire. 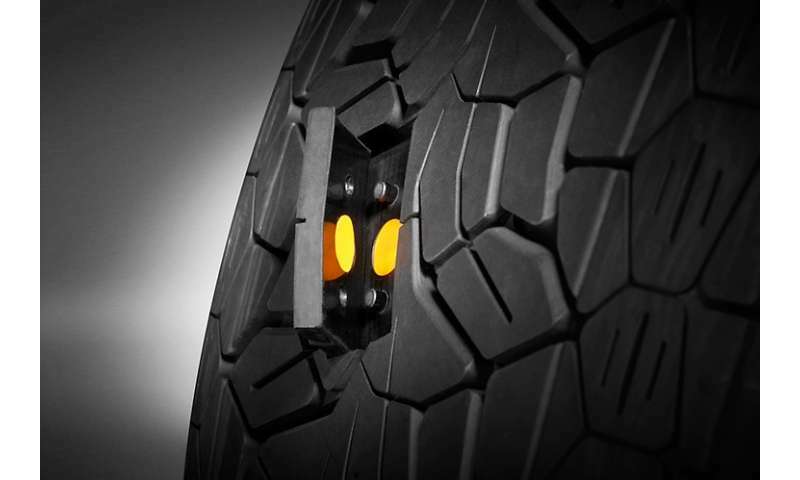 ContiSense uses monitoring sensors in the tire. They measure tread depth, temperature. They send the data via electrically-conductive rubber to a receiver in the car. Kimberley wrote, " the sensors themselves are rubber-based but can wirelessly transmit electrical signals to the car's main brain." 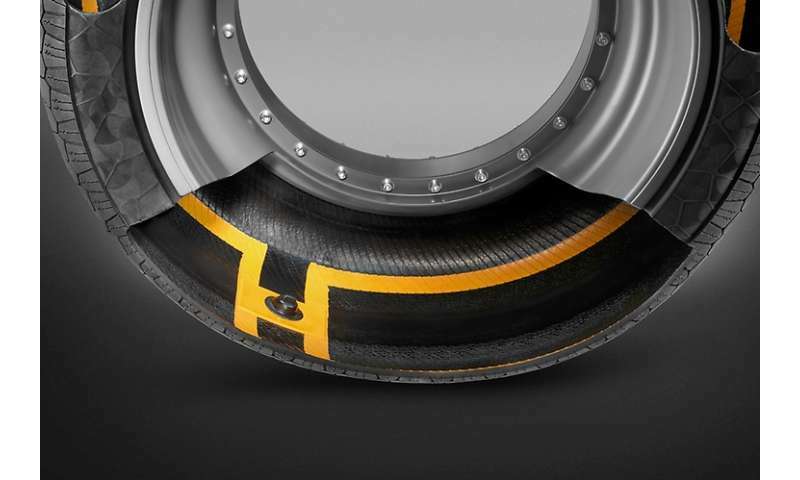 Continental explains its ContiSense as "based on the development of electrically conductive rubber compounds that enable electric signals to be sent from a sensor in the tire to a receiver in the car. Rubber-based sensors continuously monitor both tread depth and temperature. If the measured values are above or below predefined limits, the system at once alerts the driver. If anything penetrates the tread, a circuit in the tire is closed, also triggering an immediate warning for the driver – faster than the systems used to date, which only warn the driver when the tire pressure has already begun to fall." The second concept marker is ContiAdapt. Hanlon wrote that "the ContiAdapt system is proactive, does not require a human brain in the decision chain, and uses a combination of pressure and a variable-width rim to adjust and optimize the size of the tire's contact patch for prevailing conditions." Adjustments go to work, optimized either for wet, uneven, slippery or normal conditions. The system permits very low tire pressures of below 1 bar to be set, said the company, to help ease the vehicle out of a parking space in deep snow, for example, or manage a stretch of black ice. 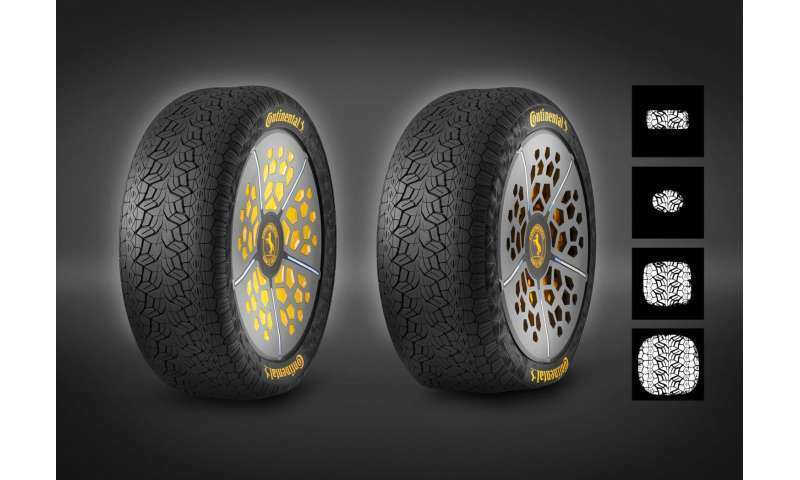 Continental also said, "Depending on the tire pressure and rim width, different tread zones are activated and the concept tire adopts the required 'footprint' in each case." Will we actually see the tires on cars and when? These are concepts. 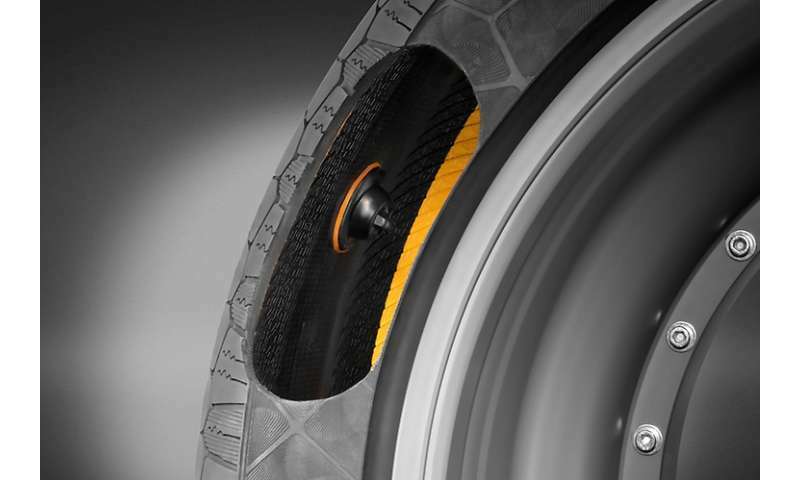 The company said they are a next step in the development of the REDI sensor, "brought to market by Continental in 2014, which was instrumental in establishing smart communication between vehicle and tire." Continental also said it "is systematically aligning its products with the future requirements of autonomous driving and electric mobility."